Welcome to the Kingdom of Graves, the second in our line of Monster Menagerie monster books for use with the Pathfinder Roleplaying Game. Each volume in this line presents a small set of monsters tied to a single theme, but spread over a range of CRs. For the Kingdom of Graves, that theme is undead with a place at court. Rather than a random collection of tomb-dusters, author Sam Hing has put together an awesome set of cold ones that tie into twisted versions of the common fantasy kingdom. We have lords, knights, maidens-in-waiting, couriers, and even siege engines, all from the black courts of the dead. This collection can be helpful to GMs in many different ways. Since the foes within range from CR 3 to CR 15, they can simply be used to augment the ranks of any undead encounter with something the players haven't seen before. However, they can also form the frame for a whole new threat should the GM decide to create a literal kingdom of graves. 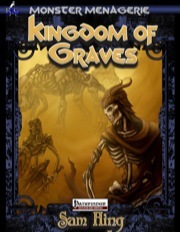 Whether it's a single castle that suffered some horrid deathless fate, a land that toils under undead horrors that openly rule mortal subjects, or a more subtle threat where a few undead lords have begun to infiltrate the lands of the living, the kingdom of graves can provide an ongoing problem for a group of PCs. Augmented with zombie soldiers, ghoul squires, and wight generals, the monsters provided here can form the backbone of an entire campaign arc, if a GM chooses to employ them in such a manner. However you choose to terrorize your players, we're hopeful you'll find something useful in our second Monster Menagerie. Now, ready yourself for the first course of the Feast of Flesh; the lich tyrant is calling for order, the dark messengers have brought news from abroad, and the bloodknights are looking for a fellow knight to challenge. One would think with a title of Mythic Mernagerie you would get mythic creatures..
NOPE, NO MYTHIC ANYTHING IN THIS PRODUCT. This mini-monster manual is 13 pages long, 1 page front cover, 1 page SRD, leaving 11 pages of content for the new monsters, so what do we get? The one page introduction makes clear the design-goal of this Mythic Menagerie - to provide the equivalent of an undead court. The first creature, the Bean Chaointe, already kicks off with everything you want in a monster - the ghostly, banshee-like protectors and scions of hopelessness and despair prove to be both blessing and curse to their families, fiercely protecting their lineage, but also bringing untold sadness. Unique signature abilities make the CR 9 spirit stand out and offer for nice roleplaying incentives. The CR 12-bloodknight, a vampiric knight who can use cursed items without penalties would make for a cool knight, but I have a problem with his presentation - while it's obvious that the knight features a modification of the vampire-template, no information on the template is given, making it hard for you to create your own bloodknights with e.g. cavalier-levels. Major bummer. The CR 5 Dark Messenger on the other hand, is again a cool creature with iconic abilities - being the heralds of undead lords, they have a kind of ability-enforced diplomatic immunity and cool abilities. Next up is the CR 10 Lich Tyrant, a take on the undead sovereign who may be a non-caster and uses a modification of the lich-template. Again, though, the cool concept is essentially squandered by not providing the template used to create the undead ruler, again preventing you from getting more out of the entry than the provided statblock. The CR 3 Masque Ghouls are a cool servant creature - by day, these ghoulish creatures look like regular folk only to become dread creatures by night, closing the niche of daylight retainers for e.g. vampires. Neat! The true Star of this pdf, though, would be the CR 15 Night Dragon, an undead dragon. Yeah, I hear you yawn, but hear me: The Night Dragon is actually an enraged genius loci, driven to action and wrathful rampages by the depravity of the inhabitants of the land, making for an interesting creature that goes beyond the expected abilities and provides a nice array of roleplaying possibilities. The CR 7 Rot Giants is a tough, disturbing creature who can disgorge skeletons of consumed foes and withstand a lot of punishment - a nice rook, to speak in chess-terms. The final creature is the CR 6 Soul Harvester, a dread, bloated creature with a spiked fist and the ability to consume and burn the souls of the fallen, which eternally strive to break through the skinny confines of its distended belly. Creepy and cool! Editing and formatting are good - while I did notice some punctuation glitches, none impeded my ability to understand the content. Layout adheres to the two-column standard and the interior b/w-artwork by Kimagu and Forge Studios deserves special mention, offering very cool images for the foes. The pdf has no bookmarks. Author Sam Hing has provided a lot of cool creatures here and the undead offer us several neat signature abilities that actually make you want to use these undead foes. However, there are some downsides, too, which tarnish an otherwise excellent offering: First of all, we don't get lore sections for the monsters, which is a bit of a pity. Secondly and more importantly, though, the bloodknight and lich tyrant are prime examples of wasted potential - why not provide the template and THEN a sample statblock instead of applying it to a creature and then omitting the template? Without it, it is quite hard (though not impossible) to reverse-engineer the modifications and create your own bloodknights and lich tyrants. This essentially robs two very cool creature variants of their true value for the customer, which is a pity. This installment of Mythic Menageries could have easily been 4.5 or even 5 stars, but due to the glitches and lack of templates, I'll have to rate it down. Make no mistake, it's still a nice purchase for the low price, but due to these minor problems, my final verdict will be 3.5 stars, rounded up to 4. Thanks to Super Genius Games' PDF sale, I figured I'd check out their line of Mythic Menageries. I'm a sucker for monster books. The Kingdom of Graves is the second in the line and the first "real" MM, the first being a collection of holiday-themed critters. So, what's the scoop? The Good: All of the art in this PDF is fantastic. Kimagu's line work is highly detailed and unsettlingly evocative. The undead monsters in the book all fit the theme of "decadent undead kingdom", and its grisly messengers, shapeshifting courtiers and mummified lich-kings evoke some pretty neat ideas for a campaign. The flavor-text is sparser than I would prefer, but it gets the job done nicely. My favorite monster in The Kingdom of Graves is probably the night dragon. Unusually for undead dragons in RPGs, it's not an actual dragon, merely a dragon-shaped vengeful genius loci of a ravaged land. The Bad: There seems to be some CR issues. The rot giant can not only dish out huge amounts of damage in melee, but has DR 10/nil and is completely immune to non-magical projectiles. Considering how few non-magical projectiles deal more than 10 damage that seems sort of redundant, but it feels a bit like there's no "right" way to fight this thing. Both the bloodknight and the lich tyrant are modifications of existing templates (vampire and lich, respectively), but they don't actually go into the details of creating one. The special abilities of both sample creatures are listed, but there's no actual template stat-block. I'm assuming that they work as the original template with the exception of the new abilities (which should impact CR, maybe? ), but as written there's no way to know for sure, and thus make your own. The Nit-picky: There's some unconventional mechanics on display here that I wish some attention had been called to. The bean chaointe, a banshee-variant that I otherwise very much liked, has a special attack that only works when she grapples, yet she's incorporeal. Can she grapple things anyway? How does this work? Final Thoughts: I wanted to like The Kingdom of Graves more than I actually did. Two of the monsters are templates that aren't usable as written, but the rest of them are flavorful and interesting. Just watch out for balance issues. I wish I could give this product 3.5 stars, but I have to round down. This product is 13 pages long. There is a cover and a forward explaining what Mythic Menagerie is as a book series. This is the second such book in the series. The concept is a collection of themed monsters, in this case undead in a royal court. Next it dives into the monster stat blocks. Bloodknight – Think vampire with some deathknight blended in. Dark Messenger – Emissary for the undead. Lich Tyrant – Typically a noble that paid a wizard to turn them into a lich. Masque Ghoul – ghouls that can masquared as the living. Night Dragon – A undead dragon that is formed as a side effect of something going wrong. They are not evil and actually want to make things better by destroying the cause that made them rise. Though they tend to attack any and everything in their rage for being brought to unlife. Rot Giant – smart zombie like giants able to create other lesser undead. Soul Harvester – eats souls and can use the souls to power abilities and spells. It finishes with 1 page OGL. Each of the monsters are at least 1 page long and most are 1 ½ to 2 pages long. Closing Thoughts: If you like undead you will like this book. These are either wholly new undead or new neat twists on old concepts. Either way they are a nice addition to your monster collection to surprise your players with. They all have a few paragraphs on how they become undead and what they are like. While they was meant to fill the roll of a undead royal court. They just as easily can be used as regular undead. I didn't see any errors that I noticed. The artwork is good and each monster has a piece of art showing them. This product gives what it claims with quality work. I am going to give it a 5 star because it was well done and interesting monsters with no errors that I could find. I picked this up as I do the overwhelming majority of Super Genius products as a way to get my new gaming material fix. SGG material never fails to inspire new ideas but this one has me rethinking a whole campaign idea. I want to include the Kingdom of Graves in my homebrew world using this product to drive the campaign as the players race to fend off an undead invasion. If you like undead in your game, and would like something new to spur ideas and confound players, look no further. "We err on the side of awesome." Though I can't Downloaded it. For some reason when i click the product link the downloads section it just refreshes the page. All the other download links are working fine. Just this product is not working. Weird my customer service forum post disappeared as well about this. Well i also sent them a email. Hopefully it gets fixed soon and I am sure it will be. Just weird. Yeah, I have the same problem and I sent an email to customer service as well (before I noticed your post DM). It's purchased, and in my downloads....but won't open ??? Same problem, it seems like the download link is not working for some reason. I am sure they will get it fixed asap. Not a biggy....I'm sure they will get it fixed ASAP. I'll be interested in a review of this one. Seems like you SGG guys are really turning out some interesting work. Thanks! The major congrats for this one go to monster-maestro Sam Hing, who did the writing. If the download issue takes more than a day to get worked out let us know, and SGG will find a way to send pdfs to people who bought copies here. I strongly suspect that won't be necessary, but be aware we'd find a work-around. I have historically been a "wait for reviews" type.....but I have enjoyed almost everything I have seen from these guy's, so I am more than willing to risk three bucks on their work sight unseen. I've emailed Paizo to see if it's something wrong with the file I uploaded or something on their end. The uploader was down for the weekend and only got fixed yesterday so it could be wrapped up in all of that. In the meantime, if you've purchased it from Paizo please email me at hyrum@otherworlds.cx with a screenshot of your receipt and I'll get you a copy plus something extra as a thanks for your patience. I'm told the download works now. Let us know if it doesn't! DLed mine, I will try and have a review up by this weekend. Reviewed and posted at ENworld as well. Heartfelt congratulations to Sam Hing, who wrote this book, which just received an ENnie nomination! Reviewed here and sent to GMS magazine. Cheers! Well, there it is. We released Mythic Menagerie: Kingdom of Graves in 2010. It was nominated for an ENnie. Its name, and the entire product line, was established 4 years before Mythic Adventures came along. Now stuart haffenden gives us a 1-star review because the word Mythic is in the title, but the book from 2010 has no mythic rules content. I'd hoped people would see the description doesn't say anything about mythic monsters and it has multiple reviews predating any possible mention of even the mythic rules playtest. Unfortunate that the title for a series that predates the Mythic rules now in place by Paizo ends up bringing about this bad mark. Yeah, most door-to-door crystal ball salesmen fail to mention that your crystal ball almost never predicts when it'll break. Definitely an incredibly unfortunate review, exposing Stuart Haffenden as not exactly doing his research. Thought there are still adjustments to be made, I thought it worth noting that these are all now "Monster Menagerie" books, to ensure no one buys them expecting to find mythic content.